Like many FWS programs, the Coastal Program (CP) focuses on landscape level action, but in contrast to Partners for Fish and Wildlife, CP works on any priority lands, whether federal, state, or private. Why a Coastal Program separate from other conservation efforts? As Stewart says, “The coasts are where the most people live.” The National Oceanic and Atmospheric Administration, or NOAA, states that 53% of the nation’s population lives in coastal counties that comprise just 17% of the land area, and this population will increase an additional 8% by 2020 (State of the Coast report). 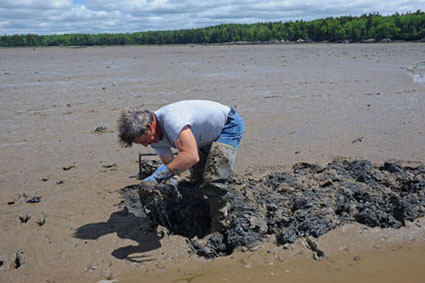 In Maine, particularly, coastal areas support migratory birds, fish and traditional livelihoods. Fefer says 96% of land within the watershed is privately owned and because the FWS focuses on the “total landscape,” private landowners are essential partners. “We develop partnerships for protecting our highest priority biological resources; we’ll work with everybody and anybody,” says Stewart. I’m a particular admirer - and previous supporter - of one of Stewart’s earlier projects on the Duck Trap River. “We worked with the Coastal Mountains Land Trust, an organization that realized when the Atlantic salmon was listed as an endangered species that they had an incredible river in the Duck Trap. They decided to work with private landowners to maintain the natural salmon run, forming the Duck Trap coalition of 26 organizations united to conserve the river and its watershed. Through an extraordinary effort over six years, they preserved - through purchase or easement - 81% of both banks of the Duck Trap. In 2008, the Pleasant River Wildlife Foundation - a land trust “committed to preserving traditional public access for residents and visitors” - began focusing on significant unspoiled coastal estuaries in downeast Maine, running fr om near Acadia National Park north to Machias Bay. FWS involvement in the project has focused on habitats. “We have a lot of information on fish and wildlife species from a landscape scale, which helps to prioritize areas for habitat protection. When we work with a land trust, we can sometimes provide access to FWS grant sources such as the Coastal Program seed fund or NAWCA, and we share GIS expertise. So what is Heads of Estuaries and what have they achieved? In the past 2 1/2 years, the project has succeeded in protecting 2,400 acres with 13 miles of marsh frontage. What’s more, agreements with owners and grant applications to further protect 1,780 acres and 7.3 miles of frontage have been completed. This is far ahead of their original 5-year goals. The key to success, says Stewart, is the local landowners. The type of landowner varies from place to place. “In Merrymeeting Bay, for instance, a lot of landowners had farms that were no longer farms; they were elderly in some cases. Thinking about the future, they decided they want the land to stay as it is. 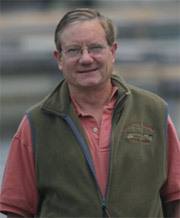 Fefer has lived in Maine since 1991, where he also went to graduate school and worked in the late 70s when he helped to establish the Maine Coastal Islands National Wildlife Refuge. More details on the many Coastal Progra m accomplishments in Maine can be found at RFF’s newly updated Maine State Conservation Center. Stewart says their key to success is community. “The proof that what we do is invaluable to our partners is the number of requests for help we receive from land trusts. The number of organizations we work with has increased geometrically.” Folks, that means in some cases, the government really is “here to help” - through their expert staff who share data, technical assistance, funding, but most of all, local values.